It’s an incredible success story. Simon grew up just a few hundred yards from where he now runs his award-winning business just outside the picturesque village of Dunning. His father and grandfather before him farmed the local area for nearly 90 years, dating back to the 1930s. Today, the business turns over £16m a year and plans are in place to grow that figure significantly. “A good fighting weight for us would be £25m,” says Simon, referring to recent investment, supported by the Scottish Government’s Food Processing, Marketing & Co-operation Scheme, which has seen a 10,000ft2 expansion of the business’s modern factory. Having graduated from Perth Academy before starting his butcher’s apprenticeship in Perth, Simon remains proud of his Perthshire heritage and the Scottish provenance of the products he provides to UK consumers. Since opening his first shop in Dunning on 19 December 1986, Simon hasn’t looked back. 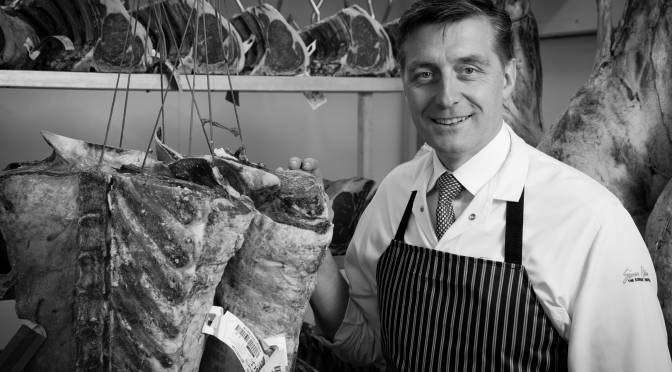 Local custom grew into supplying local restaurants and hotels before further shops were added in Auchterarder (1991), Dunkeld (1993) and the acquisition of the Perth High Street butchers where he’d served as apprentice. “In 1994, I purchased Findony Farm, which had belonged to my father’s Uncle during the 1940s,” Simon explains. “It was nice to bring the farm back into family ownership. That period coincided with an infamous food safety scandal at a butcher’s shop in Wishaw, Lanarkshire. The resulting investigation required all butchers in Scotland to become licensed and established stringent food safety standards.